Remember in 2009 when The Cove won best documentary? The film opened the world’s eyes to the annual drive hunt of dolphins in Taiji, Japan. Well the hunt continues. This weekend in fact. But the opposition continues as well. Sea Shepherd is one of the leading voices of this opposition. 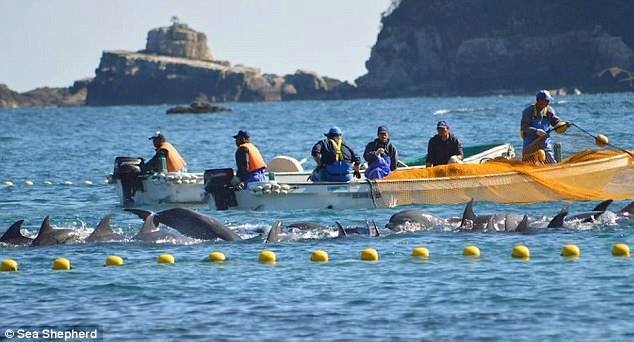 They are even live streaming this year’s round up, capturing and (I assume) slaughter of dolphins. As far as I understand, the slaughter will begin Monday. Fifteen of the animals were taken for a “life of imprisonment in captivity,” the group said, adding that one dolphin died in the process. On Saturday, the group said 25 dolphins were removed from their pod, and one died. The remaining dolphins will spend a third night in the cove before being killed Monday, the group said. CNN reported that the dolphins taken Saturday and Sunday were likely to be sold into captivity at marine parks in Japan and overseas, according to the conservation group. In an interesting connection, the popular marine park, SeaWorld, is one of the main profiteers of the Taiji hunt. This year’s popular documentary, Blackfish, details via firsthand accounts from former trainers and others how orcas are captured, trained, and kept captive through inhumane and unnatural methods. The park’s attendance and celebrity affiliations have suffered greatly due to the film’s popularity. Follow Operation Infinite Patience on social media and share with your friends and family. Ask them to help us end this atrocity. Help us end the brutal Taiji dolphin slaughter by voicing your concerns to the authorities in Taiji as well as the Japanese Embassy, US Embassy to Japan, US and Japanese Ambassadors to the UN, and the US Senate members of the Committee on Foreign Relations. This information is from Sea Shepherd and surely there is ONE action from this list that you can do. To make it even easier, here is the message I will be including in my e-mail to many of the above contacts. Please feel free to copy the text and use it for yourself as well. I am writing to express my dismay and disapproval with the continued Taiji dolphin hunt. In light of the increasing global awareness and concern of our exploitation of dwindling marine creatures, as well as the increasing public outrage (including that from Japanese citizens) toward this hunt, I believe the time for defending this tradition has ended. With respect to the citizens and leaders of Japan and admiration for many of the country’s beautiful non-violent traditions, I implore you to cease this annual hunt and bring Japan further into the more peaceful and conservationist future that is necessary for our planet and its species. Lastly, I want to exhort you to remain compassionate toward the people who carry out this hunt. I have seen plenty of comments on social media spewing hate and violence toward them, but there is no difference between that violence and the violence they inflict on the dolphins. Not essentially. And what are we doing if we counter darkness with darkness? So find your balance, find your love, and take action in your world! Love to you. And love to the dolphins. It is truly my pleasure! Thank you for taking part. I just mailed out about 8 emails in less than 5 minutes. Please feel free to share this with others while the awareness is high. Utterly horrific that this is still happening. thanks for the post. You’re welcome. Thank you again for visiting, Barb. Thank you for this post! I appreciate that you are spreading the word, and the gentle way that you do it. I am so glad to have been pointed to your blog via Eleutheria4PlanetEarth! Please keep up your good work! Wonderful to join with you! I look forward to staying connected. the Ja[panese defend the slaughter on the grounds that it is a tradition. So was human sacrifice in some places, but I don’t hear anyone defending that. Traditions are not always good. Thank you! What positive feedback. I’m glad you enjoyed the post. More to come!